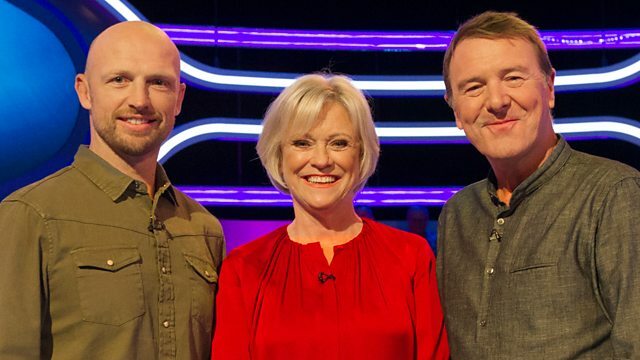 Sue Barker hosts the lighthearted sports quiz. Joining captains Matt Dawson and Phil Tufnell are Adam Gemili, Alex Scott, Hannah Cockroft and Shane Williams. Hello and welcome to A Question Of Sport. up for you and both teams are poised and ready for action. Come on, team. Come on. and, Matt, your team are up first. There's your board. Time will start when you pick the first number. -Shout them out when you know them. -OK. I'll do the numbers. We'll start with number 12, please. You had over 17 seconds left. Give us some more, we'll take more points. You're happy for us there, Phil? Come on, team, we can match that. Let's have a look at your board. There you go. Just shout them out. Number one please, Sue. No. What's his name? The Aussie bloke. Move on, move on. Seven. Oh, the keeper for Stoke. Oh, I've forgotten his name! Oh, the goalkeeper, Jack Birkeland? Jack Butland, of course it is. but Matt in front on 12. Well, now, teams, we have a sports action for you. A sighting of Patrick Reed, a birdie putt on the 13th hole. Five metres out. He hits the board. Eight metres and 23 centimetres. Could he take a medal? Oh, it's out. That is out! What did I say? His footwork has been shocking. And Newcastle really are rocked back on their heels. It's 2-0! It was a free header. Here's the moment now for Sam Murray. She's an Olympic silver medallist. puzzle, the answer to it could basically be anything sporty. you have to answer a question. If you get it right, you get a point and the chance to solve the puzzle. -This is on the buzzer. It goes on offer. Anyone want to buzz in to try and guess it? letters in, so we have an L and a U. In which sport was Sam Murray winning Olympic silver? Is correct, yes, well done. So let's see where the S and the M go. -The second word's the one, isn't it? -What comes after the U? -Do you want to move on? You saw Ana Ivanovic in action. Which is the only Grand Slam singles title she has won? -Have you been swotting up on your tennis knowledge? I've never seen such an obvious guess in my life! -Anyone going to have a guess? '09 is the right answer! Has that got a vowel after the O? Got to rush you. No answer? Who was winning European long jump bronze in 2010? Yes, it is Chris Tomlinson, well done. So, will the C T give it to you? Yeah, yeah. Go on, you go for it. Yes. There it is. Well done. Phil is on 11, Matt in front on 16.
complete, there's a bonus point. it wrong, you'll be wasting valuable time, so move on if that happens. -So, what is your first sport? show jumping and what else? -In which event has Renaud Lavillenie won Olympic gold and silver? -Double sculls, we'll give you that. I said every single sport! to add to your total. -Three points. Looking forward to this one, Tuffers? -Come on, let's have a go. And the time will start when you pick your first sport. -Can you have a guess? No? At which ground did the West Indies beat England during the 2017 Test series? Mark Williams beat which other Welshman to win the World Championships in 2000? Oh! Oh, what's his name? -Oh, move on, move on! PRO14 teams the Cheetahs and the Southern Kings are based in which country? At which racecourse is the Scottish Grand National held every year? Erm, move on - Formula 1. What nationality are drivers Esteban Gutierrez and Sergio Perez? You ran out of time with the sailing one - it was the Finn class. -So, snooker - Mark Williams beat which other Welshman? And Pascal Gross was Premier League goal for Brighton and Hove Albion. And the horse racing is Ayr. Matt is in front, on 19! Home or Away now - and we are starting with you, Adam. -Pressure time! Are you going for a home question? who won a 200m medal before winning gold in the men's 400m relay? -OK, who were the medallists? Van Niekerk for South Africa. Who got the bronze? Was it Jereem Richards from Trinidad? I'm pretty sure, I think the Trinidadian got the bronze. And this is really bad for me because it's the 200m. I'm going to say him. Erm, yeah - I won't get any closer to the answer. I'm going to say Jereem Richards. the scores. Home or Away? We've got to go away, haven't we? Basketball Championships - name them for a point each. France...? Not a bad shout. -Basically, we haven't got a clue. We've gone France, Germany and Spain. -Not bad, not bad. We'll take that. -You've just got to have a punt. And you would punt for...? -And you would punt for...? And my answer is Greece. Who won it in 2017. No bonus point there, but, Alex, it's your turn now. -I'm going to go home, Sue. and the following season reached the FA Cup final? Who won the FA Cup 2016? This one jumps out at me straightaway. -And does that fit in with...? -Does she wear blue, Sue? I'm going to go with Fran Kirby. Hannah - Home or Away? was fourth in both the 400m and 800m? There's only one girl it can be - so I'm just going to go for it. Well done, yes, it's spot-on! OK, teams. It is time to play Head To Head. And tonight, the focus will be on our guests' career stats. Phil, we're starting with your team. or the highest break at the 2017 World Snooker Championship? The break is going to be high hundreds, isn't it? So it's going to be, let's say, 130s, 140s. -And Alex has got how many caps? Lower...? It's a lot of caps. It's a lot of caps to beat. -She's not looking over here. -Which is higher? Which is higher? I would say the break at the snooker. Oh, must be a 147 there somewhere! That's a lot of football, isn't it? It's a LOT of football. Jimmy Connors has won Grand Slam singles titles. 100, 200, 400, 800, 1,500. I would say Jimmy is 10, 11, 12...? -Definitely no more than that. that she's got more than that. -We're saying H is sky-high. Thanks for talking me up, but I've won ten world titles. Oh! You've got the Olympics and the Europeans and... Oh! I only get two events every World Champs. -but I only can win two every World Champs. It is! But is it more than Jimmy? -and you get the point! -We got it right anyway. -Which one do you think is higher? -Right, so, how many points did you get? Have you kicked any, or sort of like...? -No cheeky little drop goals or anything? -Little drop goal here and there? Have you seen me kicking?! He did have a good year, didn't he? -He did have a good year. -I've got a feeling he's got more. -You reckon he's got more? Let's go with that. Shall we go with him? -Go on, then. We're going to go with Rosberg. You're going with Nico Rosberg, OK.
We've worked out for Shane, magnificent 300, but what about Nico? Do you win the point? You do! Yes, you do! -..is higher than Tuffers' first-class batting average. -Thanks for that picture as well! I love that picture as well! -Come on, then, what's your PB? 9.97 is my 100m at the moment. 9.97. Has Tuffers got a batting average...? I've got to be honest, that's not a disaster! It's not a disaster. For a number 11, you like batting number 11! I didn't like walking off on my own! cos he's got his eyes closed here! -He's going to have more. At bowling - very good bowler. -to say that he's got ten. -He's trying to throw you off. -That he's got ten point something as an average. -He deserves more credit and praise, doesn't he? No, we... I think he got to double figures, Sue. OK. We know Adam is 9.97, as he said. -So, Tuffers, do you know? I think it might be double fingers, yeah. Oh, it's not double figures! was because that was close, or they were just surprised! Let's take a look at the scores. Matt is on front, on 22! Next up is an Observation Round. For this game, it's all about coaches and managers. so make a note of everything you see. Write your answers on your tablets. OK, here's your first one. What was the nationality of the cycling coach? -I think it was, wasn't it? Romanian? What, the way he was... Yes. That's a good shout, yeah. Yeah. You saw a skier talking to their coach and waiting for their score. What colour were his boots? I didn't even see a skier. -I didn't look at his boots. Red or blue, red or blue? -Thank you, OK, let's have a look. OK, yeah, we get that. And Phil has gone white. We were looking for yellow. What was the surname of the winning fencer? And I need the correct spelling. Something like that. I don't know exactly. Love it! It was something like that. -OK, let's have a look. Jones isn't right, you'll be surprised to learn. They're very good in Wales! And I'm afraid you needed an M, not an N.
-I said we needed the correct spelling! But well done, Adam! Well done. And finally, how many Premier League managers did you see? There was loads of them there. Who was the other one? Who's he? -Is he a Premier League manager? Good work, team. Good work! -Yeah. I've got no clue! four! You both get a point, well done. Roy Hodgson and Alan Pardew were the four we were looking for. Phil on 20, Matt in front on 24! OK, teams, we're ending on the buzzer. a point away if you buzz in and get it wrong. Fingers at the ready. Here we go. Nottinghamshire beat which team in cricket's one-day final? -Who won the 200m Diamond trophy in 2017 with...? women's Champions League title in 2017? occasions between 2001 and 2007? Yes. Who finished three shots behind Jordan Spieth when he won the Open at Royal Birkdale? Yes. Which American woman won four T54 gold medals at the 2017 World...? -Sheffield United were the champions of which division last season? And who was the last boxer to beat Wladimir Klitschko...? -We've blown up there, we've blown up. Well done, guys, great work. I don't think I'll read out the scores. and also to Hannah and Shane. The three of us will be back soon. Until then, from all of us here, goodbye.